A business is often separated into a number of different branches each of which is treated as its own profit center. Branch accounting allows the business to prepare branch trading and profit and loss accounts in order that it can assess the profitability of each of these branches. The advantages of branch accounting are that the business is able to identify the financial performance of each of its branches. By making comparisons it can identify inefficient branches and make informed managerial decisions about their future. In addition managers and staff can be given responsibility and motivated and rewarded on the basis of branch performance. It should be noted that branches differ from departments in that they are operated from different locations; for example a retail business might have branches in different cities. In contrast departments are usually operated from the same location. The simplest method of branch accounting is for the head office to operate a single branch account for each branch. The method is sometimes referred to as the debtors system or direct method system. The method is most often used when there are a small number of branch accounting entries in the books of the head office. The branch account itself is a temporary nominal ledger account. The use of the branch account is best explained using as example. A business has a retail operation with a number of branches. Information extracted from the accounting records of the business shows the following details in respect of the one of the branches. Equipment is depreciated on a reducing balance basis at the rate of 20% and inventory is transferred to the branch at cost. The branch is not a new branch and therefore has beginning balances in respect of inventory, accounts receivable (amounts owed by customers), petty cash, prepaid insurance wages payable, and equipment. Since the branch account is a temporary nominal ledger account its balances are cleared at the end of each period and returned back to their respective head office accounts. At the start of the next period these balances therefore need to be reinstated into the branch account with the following branch accounts journal entries. The debit entry to the branch account transfers the beginning net assets of the branch back to the branch account. After the bookkeeping entry the branch account appears as follows. 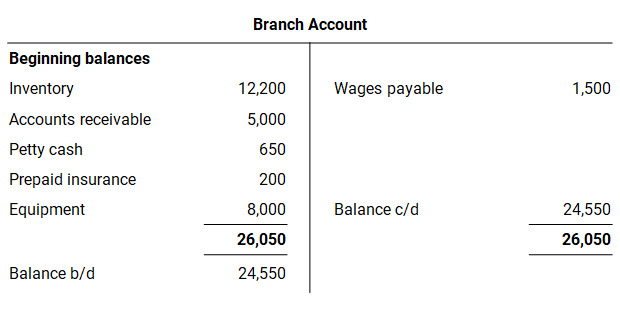 It should be noted that for the sake of clarity the individual entries making up the debit of 24,050 have been shown separately in the branch account. The next step is to post the transactions between the branch and head office which occurred during the accounting period. During the period goods (95,000) are transferred to the branch from head office. In addition the branch returns goods (1,400) to head office. The following branch journal entries are used to reflect the net movement of 93,600. During the period the branch deposits cash of 150,000 in respect of cash sales and 45,000 in respect of amounts received from customers. The total deposited in the head office bank account therefore amounts to 195,000. The bookkeeping journal entry to the branch account is as follows. During the period head office pays wages of 28,000, rent of 9,000, insurance of 700 and petty cash expenses of 1,300 in respect of the branch. The total cash payments amount to 39,000 and this is posted to the branch account as follows. After posting the transactions for the period the branch account appears as follows. Again for clarity the details of each posting are shown in the branch account. At the end of the accounting period the balances relating to inventory, accounts receivable (amounts owed by customers), petty cash, prepaid insurance wages payable, and equipment are transferred back to their respective head office accounts with the following journal. The ending balances representing the branch net assets have now been transferred from the branch account back to the respective head office accounts. The branch account appears as follows. 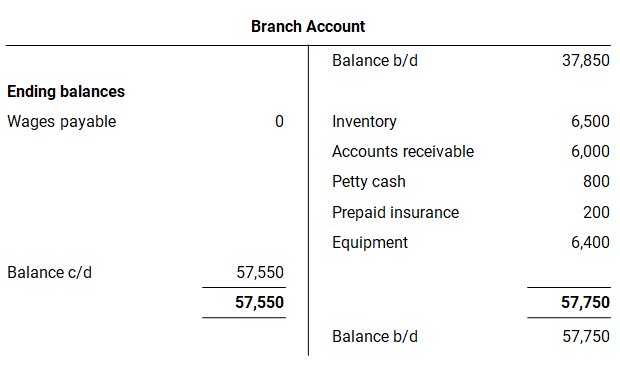 The balance on the branch account is now 57,750 which represents the branch profit for the period. This can be verified by drawing up the trading and profit and loss account for the branch. First it is necessary to calculate a number of the trading and profit and loss account entries using information from the branch account above. Our cash to accruals conversion post is a useful reference in respect of the formulas used. The amount sold to customers on credit terms is calculated as follows. Cost of sales is calculated as follows. Expenses are calculated as follows. Since there were no additions or disposals the equipment depreciation is calculated at 20% as follows. To complete the branch accounting, the branch trading and profit and loss account can now be produced in a suitable format for the business using the amounts calculated above. 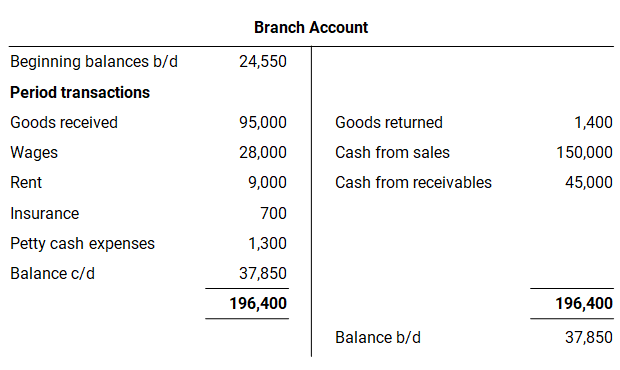 The branch profit shown in the statement above is 57,750 which is consistent with the balance shown on the branch account. The balance on the branch account therefore represents the profit of the branch for the accounting period. Finally the balance on the branch account representing the profit of 57,750 is transferred to the profit and loss account of the business. The temporary branch account now has a nil balance ready for the branch accounting process to be repeated in the next accounting period. Branch accounting is useful when a business operates a series of distinct branches at different locations as it allows it to produce branch trading and profit and loss accounts and to determine the profitability and effectiveness of each branch. The operation of a single branch account is the easiest method to adopt when accounting for branch operations; however, there are a number of other branch accounting methods such as the final accounts or branch accounting stock and debtor system where multiple accounts are opened.